Pongal is a four-day harvest festival in Tamil Nadu, the name of which means "boiling over" or "spilling over", signifying abundance and prosperity. It takes place in mid-January each year and corresponds with Makar Sankranti, which marks the first day of the sun's return journey to the northern hemisphere. Although a January harvest isn't common in the western world, India's hot and monsoonal climate provides two growing seasons. Pongal is the most popular festival of the year in Tamil Nadu, as much of the state relies on agriculture and the sun is necessary for good growth. See pictures of how the festival is celebrated in this Pongal photo gallery. 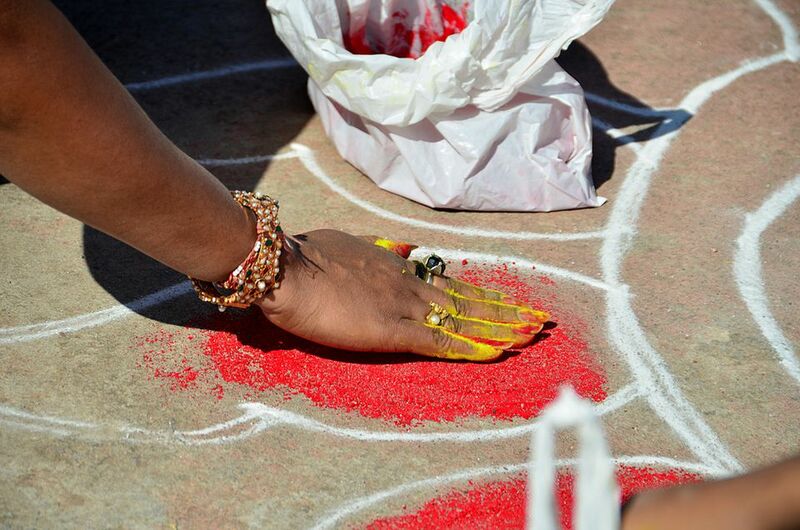 On the first day of the Pongal festival, homes are cleaned, and a kolam is drawn on the floor using plain and colored rice flour. It's not only pretty and welcoming. It also defines the sacred area where the Pongal dish is prepared. The Pongal dish is cooked on the second and most important day of the Pongal festival, and people gather to feast. It's made out of rice that's boiled with milk and jaggery (unrefined sugar) in an earthen or steel pot. Raisins and cashews can also be added. It's known as sweet pongal or chakkara pongal. Within the area of the kolam, a fire is made to cook the Pongal dish. The pot is set up in direct view of the sun. But first, the Pongal pot is decorated with turmeric root, which is cut and tied together around its edge. Turmeric signifies auspiciousness and general well-being. Vendors can be seen in Tamil Nadu selling turmeric especially for the festival. Street vendors also sell sugar cane, which is made as an offering to the Sun God during the Pongal festival. It's the harvest from a predominant crop in Tamil Nadu. In villages, the Pongal dish is sometimes cooked out in the open ground in a group. The highlight of cooking the Pongal dish is when the milk boils over. 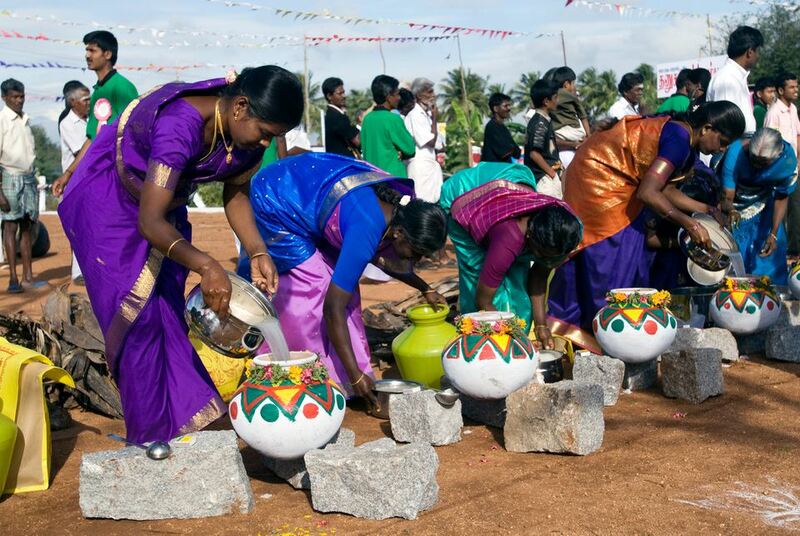 This "overflow" signifies abundance, which is the meaning of the Pongal festival. People shout, "pongalo pongal". Once the Pongal dish has been prepared, it's offered to the Sun God. After prayer, the dish is shared with family and friends. Cows and bulls take the limelight on the third day of the Pongal festival, called Mattu Pongal. This day is dedicated to decorating and worshiping farm animals that are used to perform work in the fields. It's common to see them in the street, painted different colors and adorned with balloons. The atmosphere on Mattu Pongal is upbeat and carnival-like. Head to the Big Temple in Thanjavur to see cows lined up by their owners for blessings. Jallikattu is a traditional bull-taming sport that's usually a part of celebrations on Mattu Pongal day. It involves a bull being released into a crowd of people, who attempt to grab the hump on the bull's back and hold onto it as long as possible. However, Jallikattu has been banned in recent years due to controversy over animal cruelty. Events continue to be held in protest and the legal situation hasn't yet been clearly resolved.